The knitting group I’m part of in Sacramento has a tradition of making baby blankets every time someone gets pregnant. Since we’ve got a lot of young women in the group, lately we’ve been making a lot of baby blankets. And since we were all getting tired of the usual ‘everyone make a square and someone try to seam them all together’ variety, when one of the women announced her pregnancy, I decided to try something a little different. I came up with a cute blanket, perfect for a group of knitters with varying levels of skill, designed so that a little mismatch in gauge won’t drive the person seaming the pieces together batty. As is usual for my patterns, I sat on this one for a while, working on it here and there, but not with any sense of urgency. And then Knitpicks announced their Independent Designers Program, and on a whim I sent them the pictures of the blanket, and they sent me some yarn to make a new one, and I did a little more tinkering with the pattern, and…voila. Pickets Baby Blanket, now available for download from KnitPicks.com. The original was knit in 11 different colors of Swish DK in the Heathers, but you could mix and match and come up with any color combination you’d like. 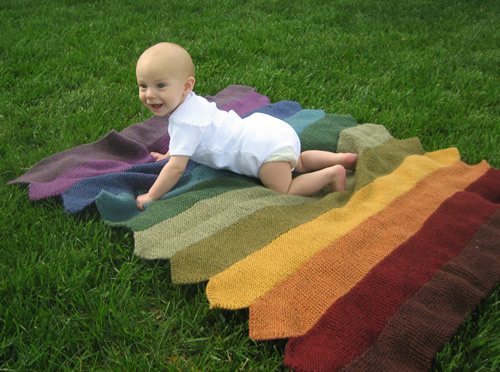 (The baby modeling the blanket is not the baby for whom we made it – this one belongs to another friend. Luckily I have lots of friends with cute babies to call on for impromptu modeling photo shoots).